We’ve been enjoying dry and sunny weather over the last few days. 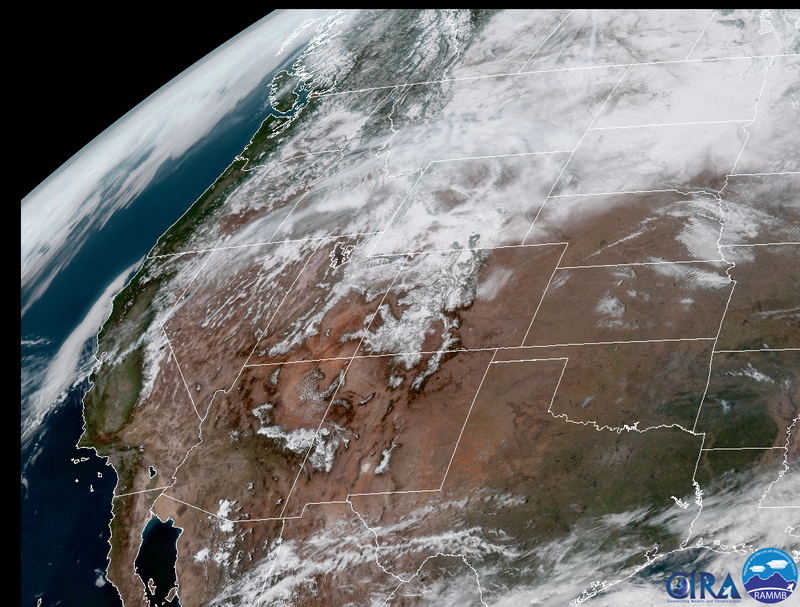 An area of high pressure has been keeping storms away from western North America, and there aren’t any major storms anywhere in the lower 48 today. It’s also been keeping pollution trapped in the valley. It’s late enough in the year that ozone is starting to be a problem, and there’s the perennial particulate problem as well. The DEQ is predicting moderate air quality for the next few days. Even with the sun this weekend, there’s a remarkable low-level snowpack. The last good winter we had (2017) was characterized by a lot of warm storms with tropical moisture, and that really kept low-level snowpack minimal. This year we only had a handful of those warm storms, so the snow has been spread evenly across the elevations. 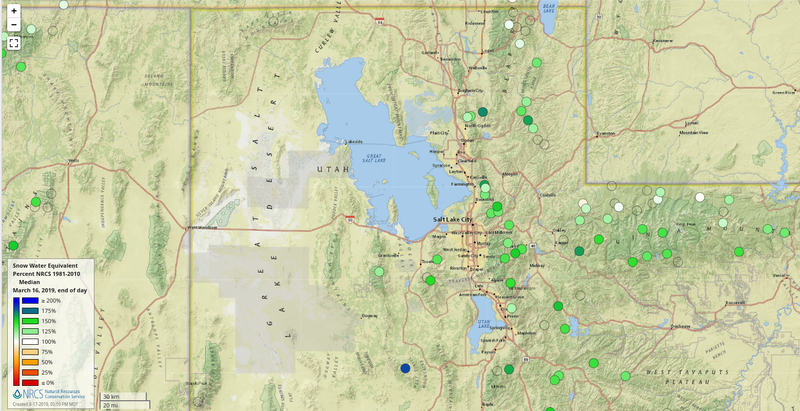 The current map of snow water equivalent at measurement sites shows the uniformity across northern Utah. The green colors in the map above show snow water equivalents between 125% and 175% of median. Virtually every site in northern Utah save a handful on the north slope of the Uintas and near Bear Lake is in that range. What this means is that there is snow in the central Wasatch nearly all the way to the valley floors on the north aspects. Also it means we’re looking very healthy for our water this year. Most of Utah is officially drought-free except for the Bear River watershed where snowfall has been at or slightly below average. However, water managers are being cautious considering last year was the driest on record, so most of the state is considered “abnormally dry”. Now the weather. There will be a bunch of clouds passing through on Monday, but the sun will be back Tuesday. Then the ridge will start shifting to a trough, and the snows will return. The first storm of the next cycle will be Wednesday night into Thursday. This will focus more on southern Utah with less falling in the Wasatch. Beyond Thursday there will be several small storms that impact northern Utah. Of course, this is far enough out that the details are variable. Stay tuned for updates.